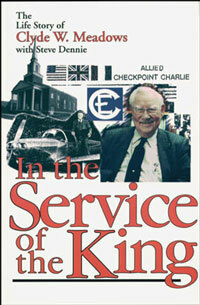 Dr. Clyde W. Meadows was the most well-known and influential United Brethren leader of the 20th Century. During 33 years as pastor of the King Street UB church in Chambersburg, Pa., he built that church into the denomination’s largest congregation. He served eight years as a bishop, 1961-1969. During one stretch, he was a UB bishop, President of the World’s Christian Endeador Union, and President of the International Society of Christian Endeavor. He was also a songwriter, a renowned songleader, a pilot, and an acquaintance or friend of most of the major evangelical leaders of the mid-1900s (including Billy Graham, for whom he once completed an altar call when the evangelist had to leave early). This is his life story, as told to Steve Dennie. The book was published in 1993.